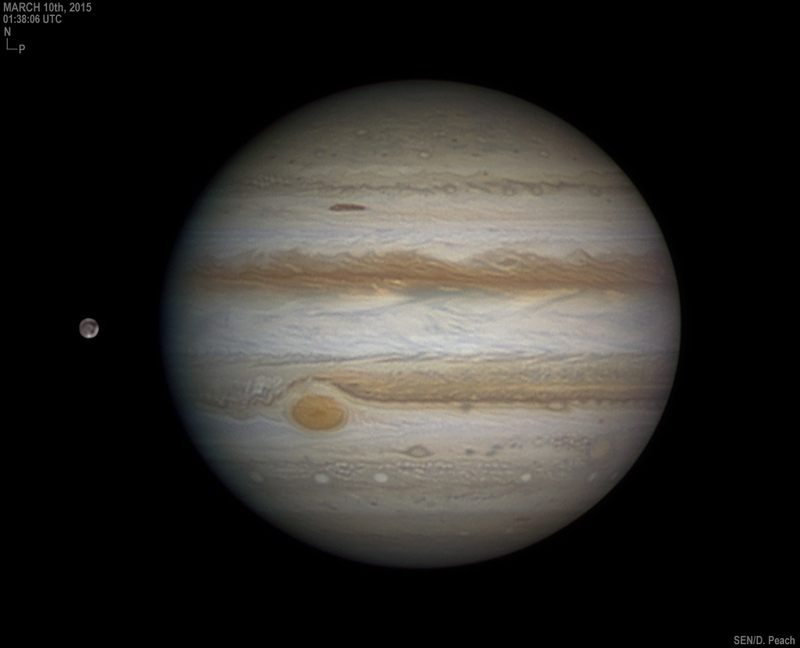 Explanation: In this sharp snapshot, the Solar System's largest moon Ganymede poses next to Jupiter, the largest planet. Captured on March 10 with a small telescope from our fair planet Earth, the scene also includes Jupiter's Great Red Spot, the Solar System's largest storm. In fact, Ganymede is about 5,260 kilometers in diameter. That beats out all three of its other fellow Galilean satellites, along with Saturn's Moon Titan at 5,150 kilometers and Earth's own Moon at 3,480 kilometers. Though its been shrinking lately, the Great Red Spot's diameter is still around 16,500 kilometers. Jupiter, the Solar System's ruling gas giant, is about 143,000 kilometers in diameter at its equator. That's nearly 10 percent the diameter of the Sun.